Sailboat is a tool for agile retrospective exercise. This exercise allows a team to think about their own objectives, impediments, risks, and good practices, in a simple piece of paper. This technique acknowledge both positive and negative things performed by a team. The Sailboat exercise is suitable for any team regardless the level of maturity. This technique is quite appreciated by teams because of its simplicity. It helps teams to define a vision of where they want to go as well as identify risks during their path. The exercise is useful for identifying what slows down in teams and what actually helps teams to achieve their objectives. When would you use this technique? This technique is rather simple and does not require a team to have any special occasion. Although, it can be interesting for situations when a retrospective is carried out with more than one team. For example, two teams that work together decide to conduct a common retrospective together because of their level of dependency on each other and because they have some ongoing issues. In this case, using the Sailboat exercise can be very interesting, because two teams are on the sailboat leading the same direction. 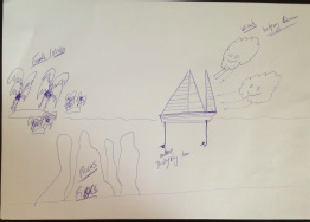 First draw a Sailboat, rocks, clouds and couple of islands, just like on the picture below. The islands represent teams´goals and/or vision. They work everyday to achieve these islands (goals). The rocks represent the risks they might encounter towards their goals. The anchor on the Sailboat is everything that slows them down on that journey. Lastly, the clouds and the wind represent everything that helps them to reach their goals/vision. When you draw this picture, stick it on the wall. Write a team goals or a vision on it. Afterwards, let the team start brainstorming and ask them to write their ideas. Give them ten minutes. Later, give five minutes to each person to read out loud their ideas. Now, discuss together with the team how can they practice what is written on the “clouds” area. These should be good ideas to help the team. Then discuss the ways for a team to mitigate risks that were described. At the end, together with the team choose the most important issue that slows the team down. If you do not find any agreement, use vote dots. At the end you can define what steps should they follow to fix the problem. This way you can close the retrospective. If you perform this exercise in a collocated team you can use tools like Lino. This tool allows a team to do everything what they need in order to run this exercise. This exercise is taken from the book “Getting Value out of Agile Retrospectives”. written by Luis Goncalves and Ben Linders. The book can be downloaded for free on leanpub.com or InfoQ.com. In case you are interested in Agile Retrospectives we´re at the moment preparing a 10 Days FREE AGILE RETROSPECTIVES PROGRAM. This is a complete self-study program where you will learn anything that you need to become a great Agile Retrospectives facilitator.